Last night I went to bed with a new plan: I would wake up, get dressed, and then give God my first five minutes. I tend to pray periodically throughout the day, but I struggle to give him a dedicated time early in the day that I can just talk to him. So I got up (a little earlier than usual), got dressed, and set my iPhone's timer for five minutes. I didn't even start the coffee first. Aside from absolute necessities, God got my first five minutes. Another thing I did last night was plan ahead about what I wanted to pray about. That doesn't mean that the Holy Ghost wasn't involved in my prayers. It just means that he and I worked it out beforehand about the subject matter. I knew I wanted to pray for a guy at church who I've become burdened for and I wanted to pray for my church in general, as we are going through a transition of sorts. When you're tired, it's hard to pray "well." Or pray at all. 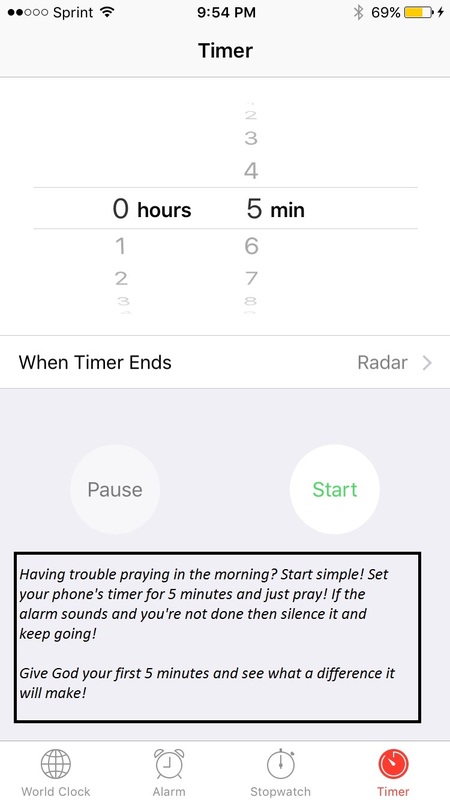 By planning ahead, and setting a timer to keep yourself honest, you'll go a long way to reaching your prayer goals. Give it a try and let me know in the comments how it goes! I can commiserate about the difficulty of consistent prayer. I have never been one of those prayer warriors we here about. I was given a personal planner/prayer diary for Christmas. 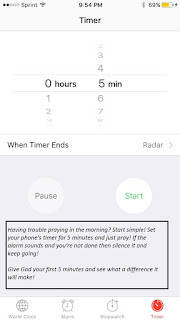 I am determined to use it as a tool to increase my prayer time. My hours at work have been changed. I still get up early (is O dark hundred real navy talk? ), but now I am using the time to pray. It is somewhat a question of habit. It is a case of put off/put on that Paul talks about. Keep posting on this. Maybe we can provoke each other to good works. My friend! I'm so glad you wrote. I know it's been a long time since I've posted regularly. Look into my other blog project: http://examinescience.wordpress.com. I agree about provoking each other to good deeds. I will add praying for you to my tasker.